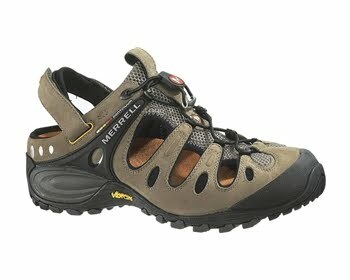 This is the Merrell Sport version of their Chameleon Cargo sandal, the main difference between this and the standard mens sandals being that the leather upper is replaced by a synthetic leather upper, but is more comfortable and a better option for someone like me who will wear them to death over the summer period. My reason for choosing these was mainly for the latter stages of the Grand Union Canal Race in late May, with them being the option of fresher feet in the closing stages, although they won’t be used for a massive amount of distance. Because of this I have been not only walking but running in them and can report they are fantastic (and I’m not just saying that to please the sponsors). The sandal is a good fit from the start, with its adjustable lacing systems, comfortable heel strap (which didn’t rub on the run and cause blisters – a feature often found with sandals) and all supported by Merrel's Vibram soles. The Orthlite footbed gave a snug, but not restrained fit and it air cushioned Midsole cushioned my weight nicely. Colour-wise (Kangaroo and Boa – brown and tan basically) these are designed with the outdoor adventure types in mind, and well suited they are. Ideal for scrambling around hard trails, due to very good grip, and well protected with a moulded toe cap to help you feel at easy on the rocks. My feet were kept cool, despite many miles of running and walking (17 in all) but the only downside is that they don’t dry too quickly due to the cushioned footbed, but that’s a minor issue and not one that worries me. All in all the Chameleon Cargo does everything a sandal should do and a lot more and takes outdoor sandals to the next level – I am hopefully off to Greece, Kuwait and the Sahara in the next 12 months – don’t know if they will be suitable for running 150 miles, but they will be ideal for exploring, before during and after (as well as lying by the pool or on the beach). My immense thanks to Adam Smith at Fitness Footwear for giving me the chance to try and review their footwear once again.